Mufa Ghadiali, MD FACS was born in Iowa Falls, USA. His family emigrated to their homeland of India, which enabled him to attend high school in Bombay (now Mumbai). Following an exuberant exposure to eastern medical practices, he returned to the West to pursue studies at Oberlin College in Ohio. He attained double majors in Biochemistry and Chemistry while earning a degree of Bachelor in Arts. He was awarded High Honors in Chemistry. Dr. Ghadiali attended medical school at the University of Texas Southwestern in Dallas. 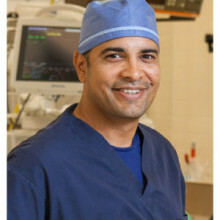 He completed his surgical training at Marshall University in Huntington, West Virginia where he focused on laparoscopy and minimally invasive surgical techniques. He was awarded the distinction of Chief Resident of Surgery in June, 2005. Dr. Ghadiali is certified by the American Board of Surgery and is a Fellow of the American College of Surgeons. He is currently in a solo private practice. He holds staff privileges at Holy Cross Hospital, Imperial Point Medical Center, North Broward Medical Center, Broward General and Florida Medical Center. Dr. Ghadiali is board certified by the American Board of Surgery in general surgery. He has had intensive training in General, Oncologic, Critical Care and Endocrine Surgery. Expert in minimally-invasive surgical skills involving laparoscopy, endoscopy, fluoroscopy, lymphoscintigraphy, ultrasound and endovascular techniques.